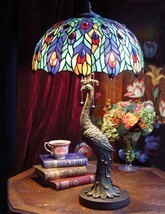 Home » marciatreasures' booth » Victorian Tiffany Style Peacock Lamp,28''H. GORGEOUS BRAND NEW TIFFANY STYLE PEACOCK LAMP. IT MEASURES 28'' TALL. GREAT ADDITION FOR YOUR HOME!THANKS FOR LOOKING!